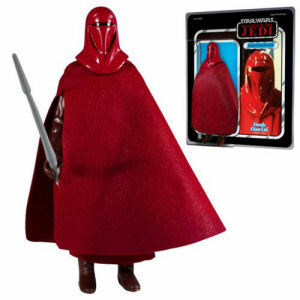 We have Just Sold out of Star Wars Emperor Royal Guard Jumbo Vintage Kenner Action Figure. This Item is unavailable at present. From the Star Wars Return of the Jedi collection by Gentle Giant. Star Wars Emperor Royal Guard Jumbo Vintage Kenner Action Figure. Measures 12 inches tall. This Star Wars Action figure comes in a re-sealable plastic outer clamshell to help protect and display. Ages 14 and up. Reproductions of the original 3.75 inch Kenner action figures. Digitally scanned to create an exact replica that is larger. Each figure is reproduced using roto and injection molding and will be made of durable plastics. Gentle Giant Star Wars Action Figures shipping from Canada. No Surprise Border fees or Customs!